It is with great sadness that I share with you today the news of the death of Professor Emeritus of Theatre and Drama Fred Gaines, who passed away early Monday, April 19 after a battle with pancreatic cancer. He was 72 years old. 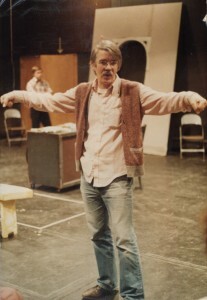 A native of Lincoln, Nebraska, Fred joined the Lawrence theatre arts department in 1977 and was appointed the James G. and Ethel M. Barber Chair in Theatre 10 years later, a position he held until his retirement in 2000. During his career, Fred epitomized the dedicated educator while remaining an active artist, passionately pursuing his love of language throughout his life. 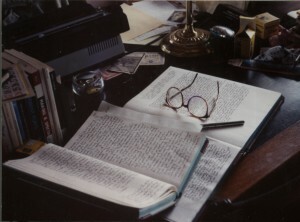 A productive writer who constantly explored new and interesting topics, he wrote more than 80 plays, many of which were performed on stages throughout the country and the world, including Minneapolis’ Guthrie Theatre, New York’s Ellen Stewart Theatre, the Cleveland Institute of Music, Club Theatre de Notre Dame in Cahors, France as well as Lawrence’s own Cloak and Stansbury theatres. 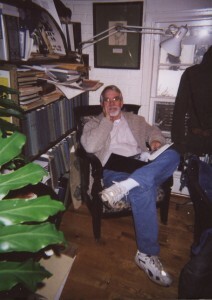 As a playwright, he was the recipient of Guggenheim, Fulbright and Eugene O’Neill Fellowships. In addition to writing, Fred directed more than 70 stage productions, acted in dozens more, wrote a pair of series for public television, and penned several movie scripts. The last production he directed was “Hometown,” a play he wrote about Appleton during World War II that was produced by Attic Theatre and performed in Cloak Theatre in March 2008. Known for his incredible generosity to students, he was a compassionate and challenging mentor and a champion of student-driven projects, fostering an ethic of exploration through collaboration. He offered a wide array of tutorials and supervised independent study projects not only on all aspects of theater, but also filmmaking, poetry writing, fiction writing, as well as other kinds of experimental artwork students brought to him. For most of his tenure, he closed the academic year with a big picnic in his back yard for all the students and any faculty who were involved in theatre productions that year. Fred also gave generously of himself to the greater community. He was a long-time volunteer writing teacher at the Oneida Nation Reservation, taught at Appleton Renaissance School for the Arts, and wrote a series of short “Plays on History” that are still performed each summer at the History Museum at the Castle. In retirement, he taught a writing class for inmates at the Outagamie County Jail, always lending positive, but honest support for their works. 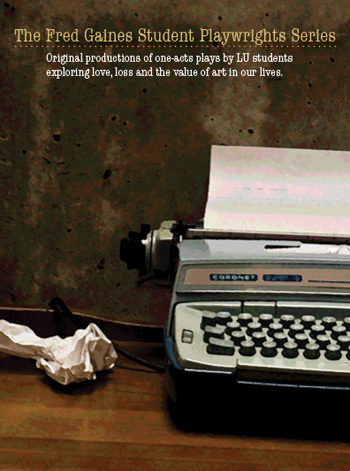 He edited and published some of the writings of his inmate students in two volumes entitled “Writers Inside” in 2008 and 2009. His numerous community efforts were recognized in 2008 with the Celebrating Our Volunteers Paul and Elaine Groth Mentoring Award. Prior to joining the Lawrence theatre arts department, Fred taught at the University of Minnesota, the Minnesota Institute of Art and Hope College. He earned his bachelor’s and master’s degrees at the University of Nebraska and his Ph.D. in theatre arts at the University of Minnesota. He is survived by his wife, Judy, of Appleton, and children Matthew ’84, Netanya, Israel; Sarah, of Appleton; Sam ’93, of Appleton; and Jennifer ’97, of Appleton; and nine grandchildren Topaz, Ruby, Opal, Sapir, Ziv, Zachary, Elizabeth, Lillian and Charley. A memorial service is scheduled for Saturday, April 24 at 11 a.m. in Cloak Theatre with an opportunity to greet the family TBA. In the meantime, I am sure the entire Lawrence community joins me in sending our warmest sympathy and regard to Fred’s family. Lawrence alum John Middleton ’86 reminisced beautifully about Fred in January for the website Minnesota Playlist.